Another summer, another show — Helen on 86th St.
A huge BRAVO goes out to my fearless teens and interns this summer from the Lucy Moses Summer Music Theatre Workshop, for doing Bollywood justice, and bringing Mitali Perkin's poignant book, "Monsoon Summer" to life so beautifully. Man, we put them through a lot! 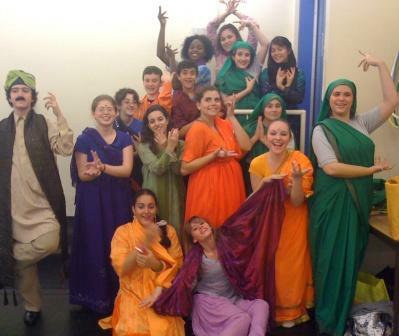 Not only did they have to do the usual singing, dancing and acting, but these teens also had to try and master Bhangra, Bollywood and Kathak dance, dissonant Indian melodies, complex harmonies, and learn how to play the percussive musical accompaniment for our score in four weeks. It wasn't always easy, but in the end, we pulled it off, and managed to expose the Kaufman Center/Merkin Concert Hall community to the magic of India and the wonder of Bollywood. A second BRAVO goes out to Program Director Sean Hartley and Assistant Director Amy Sulds, and all my fellow composers, writers, directors and choreographers: Beth Sorrentino, Marisa Joseph, Clay Zambo, Jihwan Kim, Scott Ethier, Dan Acquisto, Gabriel Luce, Ben Tostado, David Gordan, Wendy Baker, Suzanne Gregorie, Steve Brennan, Jason Robinson, Christine Barklay and Angie Gomez for their wonderful work. This was the first summer that LUMO partnered with First Books, a fantastic non-profit organization that provides new books to children in need. What this meant was that we had a bevy of great books to choose from to adapt this summer, and the author's blessing to musicalize their writing. And for all you writers out there who have ever tried to option the rights to a book or a story, you know just how much a blessing that really is. You can learn more about the great work this organization does, here. Speaking of great non-profit organizations and partnerships...I have some exciting news about an upcoming Helen partnership with another great non-profit organization.